A couple of things about stairs – 1. They usually take up more space than you would first imagine. 2. There are some quite complex Building RegulationsThese are the mass of regulations that cover safety, health, welfare, convenience, energy efficiency etc. in the way buildings are constructed. Not to be confused with Planning consent (which is more to do with whether you can put up the building in the first place). See more on the regulations which determine the dimensions to do with width, riserson a stair - the vertical parts (or the vertical distance) between the treads and goingson stairs, the going is the horizontal depth of a step, in other words the horizontal distance from the nosing of one step to the nosing of the next..
A fair number of timber merchants and joinery manufacturers in the UK are still claiming to be supplying sustainably sourced parana pine staircases. However the scientific literature from groups such as Geographical Paper No.180 by J.V.M. Bittencourt , University of Reading, shows the devastating manner in which parana pine has been over harvested and it is difficult to imagine how any real volume of the timber can be available on a sustainable basis. It is on the IUCN Red List of Threatened Species as a critically endangered species. Although many staircases are now supplied as whole systems which are modified for the particular purpose, there are still many occasions when it may be better to revert to traditional joinery, metalwork or masonry. This is particularly true where repairs, changes or extensions are being made to a house or traditional features require matching. 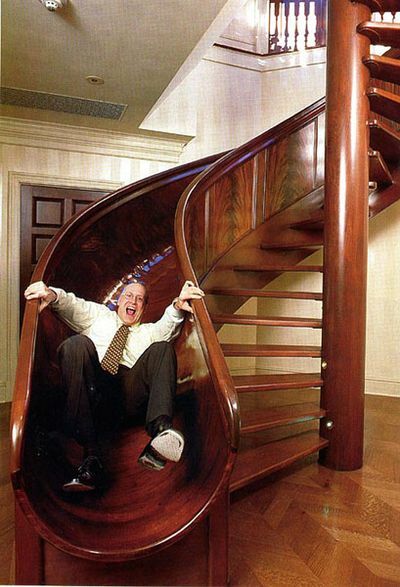 The exception to this is spiral stairs where it usually makes sense to utilise a prefabricated system. At its simplest this involves a straight flight with a landing area at the top and bottom. This is usually the cheapest type to build and is most economical in terms of floorspace, taking up about 10 m² in total (i.e. both floors). Because the lower and upper landing are so far apart horizontally it may be difficult to fit in with the room layout. This is the layout generally used when the lower landing is in the hall or living room near the front door. The spaces around, under and above stairs can range from grubby little cupboards to opportunities to display all kinds of beautiful artefacts such as plants, pictures works of art, creative lighting etc. This is more true with open tread and spiral stairs where the spaces are more visible. Not that there is anything wrong with cupboards under stairs but given the non-rectangular, somewhat sculptural shape of stairs it provides a chance to be creative. With long straight flights it may leave space beneath the stairs for a doorway through to another room or a small space for a desk, stereo etc. Because of space configurations there is often a half landing and then a turn of 180°. This allows the top landing to be vertically above the bottom one which may be useful with some types of room layout, especially for external stairs. It’s more expensive to build and takes up about 14 m² of floor plan. It may also be more difficult to arrive at a good design for the spaces below the stairs so it can look a bit poky. Alternately a turn of 90° may work and this configuration can be particularly useful if you are wanting to link lower and upper floors where the circulation spaces don’t match easily, for instance if you are linking together two existing adjacent properties. Adjusting where the half landing occurs on the stairs can also be used to make adjustments between irregular floor levels. Takes up 12 m² of floor plan. They can be beautiful in a purely sculptural way, especially regarding the materials they are made of. Stairs on an outside wall can be lit by a tall window: the Victorians often commissioned stained glass work for these. Half landings can incorporate areas to place objects of beauty or window seats. Pattern Language suggests a window affording a Zen view. Landings can be very interesting areas especially if they are part of a gallery[for the purposes of part B of the Approved Documents] - A raised area or platform around the sides or at the back of a room which provides extra space. which overlooks rooms below or a courtyard. The main structure of the house may suggest the type of stairs which seem best suited. For instance a very heavy masonry structure may be able to support cantilevered treads. Open risers are often used on modern houses. Timber houses would seldom use masonry stairs for structural reasons. Stair treads obviously need to be hard wearing and it is almost as if stairs have been divided into two types historically: ones which were meant to be carpeted and ones which were meant to be left exposed. The carpeted ones (usually with timber risers) were normally with softwood treads which wear down if not covered. The exposed ones tend to be mainly hardwood but also stone, concrete, terrazzo, steel (usually with a covering such as cork, rubber, timber etc.). If you are using timber for the stairs then this is an opportunity to show off some of our beautiful native timbers. Because staircases use a relatively small volume of timber it is possible to splash out and use the best. Most people know of ash and oak but there are several more exotic species in terms of colour and grain. Native cherry has slightly pink streaks with yellow markings. Native yew is very exotic in terms of its rich red/brown grain mixed with cream. The fruit woods are light in colour and elm has a rich and charming grain. Alder can have strong streaks of red if treated with oil. With the growing awareness of Lifetime Homes"Lifetime Homes make life as easy as possible for as long as possible because they are thoughtfully designed. They provide accessible and adaptable accommodation for everyone, from young families to older people and individuals with a temporary or permanent physical impairment". See the Lifetime Homes page and the Lifetime Homes Foundation web site there is a strong case for considering how stair design might relate to lifts and stair lifts, not necessarily for your own use but also as a way of making a house easier to sell in the future or for the use of a disabled relative. With an ageing population, this will become an increasingly important issue. The regulations, (mostly Part KThe Approved documentsApproved documents (England) are detailed publications which come under the English Building Regulations. They are based on tried and tested methods of building and if you follow them you are assured of complying with the Regs. The equivalents for Scotland are the Technical Handbook, for Wales: the Approved documents (Wales), and for N.I. the Technical Booklets, (England) part K, deals with Protection from falling, collision and impact. Included in this is staircase design), have a lot to say about stairs. The information below is mainly about calculating pitch and tread size but go to part K to see details on other design requirements such as handrails etc. Below are extracts from the Building Regulations where stairs in houses are termed ‘Private stairs’ (Utility stair is defined as a stair used for escape, access for maintenance, or purposes other than as a usual route for moving between levels on a day-to-day basis). between the minimum and maximum, that complies with the relevant note contained in table 1.1. The maximum pitch for a private stair is 42°. For dwellings, for external tapered steps and stairs that are part of the building the going of each step should be a minimum of 280mm. * The normal relationship between the dimensions of the rise and going is: twice the rise plus the going (2R + G) equals between 550mm and 700mm. For existing buildings the dimensional requirements in Table 1.1 should be followed, unless due to dimensional constraints it is not possible. Any alternative proposal should be agreed with the relevant building control bodyA term used to include both Local Authority Building Control and Approved Inspectors. and included in an access strategy (refer to Approved Document M). Steps should have level treads. Steps may have open risers, but treads should then overlap each other by at least 16mm. For steps in buildings providing the means of access for disabled people reference should be made to Approved Document M, Access and facilities for disabled people. All stairs which have open risers and are likely to be used by children under 5 years should be constructed so that a 100mm diameter sphere cannot pass through the open risers. There is also a big section on ‘Means of warning and escape‘ under part BThe Approved documents, (England) part B, deals with fire, Fire Safety, which is to do with how directly and safely you can get from an upper floor down to a ground floor and out of the building. It can determine much of the design and layout of stairs including fire doors and protected stairs. Below is an on-line calculator to help work out the dimensions of stairs. Note that the variables can all affect each other so you may need to play around a bit. Bear in mind that the calculator works on clear width and does not take into account the extra width taken up by handrails and other guarding such as balusters or glazing. This live spreadsheet is based on the Building Regulations and works on the assumption that you have a fixed floor to floor dimension (total rise) but you may want to vary the number of steps and their size and the slope. It is probably best viewed on a desktop computer as it contains a live spreadsheet. You can input the number of risers you want and their goings and the spreadsheet then checks whether they conform to the Building Regulations. Enter your guestimate values into the green boxes and then the red text comments indicate whether the necessary conditions are met. Other values such as riseron a stair - the vertical part between the treads height and pitch get calculated. If the conditions are not met you need to try different goings and risers. Stairs are limited to 36 consecutive risers in a flight unless there is a change in direction. See para 1.14 in the Approved documents. The greater the going the shallower the pitch of the stairs. You can’t have a combination of the maximum risers (220) with the minimum goings (also 220). It makes it too steep (over 42 deg). Longer goings make for shallower but longer stairs. If this result does not fall within 550-700 try adjusting the risers (via the number of risers) and the goings. The formula comes from the Building Regulations. These calculations give you results as if there were no nosingsthe front edges of steps, which usually overhang the step below by a small amount on the treads. That is fine because you can simply add nosings to the steps afterwards without altering the basis of the calculations. However doing so can affect two things: both the headroom and the lower landing width will be reduced marginally. The headroom must always be 2000 min. and the width of the landing is determined by the regulations. A headroom of 2m is adequate on the access between levels (see Diagram 2). For loft conversions where there is not enough space to achieve this height, the headroom will be satisfactory if the height measured at the centre of the stair width is 1.9m reducing to 1.8m at the side of the stair as shown in Diagram 3. The regulations include various other requirements such as lengths of flights, landings and handrails. See Protection from falling, collision and impact – part K of the Approved documents. They can be extremely elegant and visually satisfying. This is partly the spiral shape itself and partly the visual connection which can be created between the two or more floors. They can also introduce an element of novelty. Spiral stairs are quite sculptural and can sometimes intrigue the mind as to exactly what holds them up. They can be an opportunity for creative lighting, especially in the way shadows of the circling steps can be used. Sometimes they will allow stairs to fit into a space which would be difficult for conventional stairs. However it can work the other way because of the greater width of the treads which is usually required by the Building Regulations. Is there enough space for them to fit in? Will the turn of the stairs allow for the upstairs landing to be in the right place? Will the upstairs landing work when headroom over the stairs is taken into consideration? If there is a centre pole, how is it supported? Is fire proofing between storeys an issue? Do you want a factory made kit system or a custom design? Most of the factory made systems have good on-line information about the dimensions of their various models and you can establish pretty quickly whether there is enough space. If you are wanting custom made spiral stairs then the Building Regulations are quite complicated and there are some calculations to do. Basically the regulations are there to make them as safe as normal straight stairs in terms of risers, going, headroom, guarding (handrails etc. ), numbers of steps in a run, landings and width of treads. There is a complex relationship between the going, the riser and the width of the stairs and this determines how much the stair turns. It is, for instance, possible to design a narrow spiral staircase to rise by 2.5 metres with only a bit more than half a turn. But the question arises as to whether you are heading in the right direction when you reach the top. If not you may need a large and awkward landing to get facing the right way. If you have wider going (treads) then you will complete more of a circle. The headroom you need over the stairs may eat into the area of the landing above. There are minimum areas stipulated by the regulations. Half landings may be necessary in some cases such as when adjacent floor levels differs by something other than a storey[for the purposes of part B (fire) of the Approved Documents to the Building Regulations] this includes - (a) any gallery if its area is more than half that of the space into which it projects; and (b) a roof, unless it is accessible only for maintenance and repair. height. This will then involve a specially made half landing which may not work well with a kit stairs. Each tread needs supporting and fixing at both ends unless it is cantilevered off a centre post. This can be done a number of ways. If there is a centre pole it can support the centre end of the treads but it also needs fixing top and bottom. Usually the bottom of the pole has a plate which is fixed directly to the floor. The top of the pole can go up to the floor above (or a structural element incorporated in the ceiling) or it can be fixed to the upper floor, in which case it needs a lateral support which may also serve as the upper landing. This is the most usual configuration. The outer ends of the treads are often fixed to each other using the ballustrading which supports the handrail. This gives added strength and rigidity to the whole structure. a method of rigidly fixing succeeding treads to each other at both ends so that they effectively form a string similar to stairs with a centre pole. It may be possible to support the outer ends of treads on surrounding walls either by fixing to them or cantilevering out from them. If they are cantilevered then the stairs can be centreless or there can be a pole, or the steps can be stacked on top of each other. The Building Regulations for straight steps generally apply to spiral stairs but there are special methods for measuring curved stairs and design is based on BSBritish Standard 5395-2:1984. The going of tapered treads should measure at least 50mm at the narrow end. Where consecutive tapered treads are used a uniform going should be maintained. Where a stair consists of straight and tapered treads the going of the tapered treads should not be less than the going of the straight flight – these treads should satisfy paragraphs 1.1 to 1.5. This calculator is based on Approved Document Part K 2010 which in turn uses BS 5395-2:1984. It is probably best viewed on a desktop computer as it contains a live spreadsheet. Enter your guestimate values into the green boxes and then the red text comments indicate whether the necessary conditions are met. Other values such as riser height and pitch get calculated. If the conditions are not met you need to try different goings, etc. The radius is the radius of the outer (larger) curve on the stair. The width is the width of the treads. Bear in mind that after you have calculated the stairs you will need to allow something extra in width for things like the thickness of handrails (and space for hand movement), balustrades, stair construction etc. Enter your guestimate values into the green boxes and then the red text comments indicate whether the necessary conditions are met. Bear in mind that the calculator works on clear width and does not take into account the extra width taken up by handrails and other guarding such as balusters or glazing. With spiral stairs of a metre or more in width things get quite complicated because the steps have to be checked in two places for steepness and size. (see diag. 1.9 above) This means there are effectively seven variables which can all affect each other. The best way is to simply play around with the calculator and get a feel of the dynamics. Values such as riser height and pitch also get calculated. Having more risers than the minimum may make for a less steep stairs. The risers will be smaller and the formula (2x riser + going) will allow for longer goings. Note that with the riser dimension it is necessary to work to fractions of a millimetre since the cumulative effect of many stairs can make a large difference to the overall floor to floor dimension. Remember that the space needed for the stairs will be slightly larger than the radius because of handrail, banisters etc. Increasing the width has the effect of creating a larger difference between the two goings which get measured and this can cause the outer (2R+G) formula to exceed its limit. Note that the radius of the stairs might be much greater than the stair width. Thanks Gideon, British Standards tend to disappear pretty quickly when they are made freely available on the net. You have to spend the best part of £100 to buy this one. This all goes back to the Thatcher years when “there is no such thing as society” meant that agencies such as British Standards got privatised. This was theft of public information into the private realm. But what do you expect from that type of government. Hi – this is brilliant. THANKS! Your link to the BS5395 doc doesnt work though..
A straight staircase against right hand wall (going up)ground floor to first floor (1970s house)eight feet floor to ceiling, 14 steps, need to know minimum height from front of step to ceiling. Has anybody got any information on who can come and build me a helical staircase or two, preferably good and cheap. Lincolnshire area. many thanks. Thank you for your post. I am designing a helical staircase for a university project, it is composed of 3 parts that get steeper. The risers are respectively 90mm, 105mm, 129 mm. Unfortunatly, if I refer to Part K, the minimum rise should be 150mm. Des this vary BS 5395-2 ? Is there a minimum rise value at all for helical staircases? Not quite sure what you mean by deviation. But if you mean ‘can you stretch the rules a bit’ then the answer is maybe. You can sometimes get what is called a ‘relexation’ of the building regulations. A relaxation is most often given when changes are being made to existing buildings when a slight ‘bending’ of the rules might lead to some other major gain. E.g. headroom is sometimes relaxed. Is there a maximum permissible deviation for the dimensions of each tread / riser? Thank you so much for this spreadsheet!